Last night after the midnight release of the new Nintendo Wii U gaming console, we did what any self respecting hardware fan would do: we tore it apart. That's right, while live on our PC Perspective Live! page, we opened up a pair of Wii U consoles, played a couple of games on the Deluxe while we took a tri-wing screwdriver to the second. Inside we found some interesting hardware (and a lot more screws) and at the conclusion of the 5+ hour marathon, we had a reassembled system with only a handful of leftover screws! If you missed the show last night we have archived the entire video on our YouTube channel (embedded below) as well as the photos we took during the event in their full resolution glory. There isn't much to discuss about the teardown other than what we said in the video but I am going to leave a few comments after each set of four images. OH! And if you missed the live event and want to be apart of another one, we are going to be holding a Hitman: Absolution Game Stream on our Live Page sponsored by AMD with giveaways like Radeon graphics cards and LOTS of game keys! Stop by again and see us on http://pcper.com/live on Tuesday the 20th at 8pm ET. During the stream we promised photos of everything we did while taking it apart, so here you go! Click to get the full size image! Getting inside the Wii U was surprisingly easy as the white squares over the screws were simply stickers and we didn't have to worry about any clips breaking, etc. The inside is dominated by the optical drive provided by Panasonic. Continue reading to see ALL the images from our Nintendo Wii U Teardown!! There were two ribbon cables, one for the front panel and one for the optical drive, otherwise the extraction of the hardware was pretty easy using a combination of tri-wing and Philips screws. You can see the fan on the rear of the Wii U exhaust, a bit bigger than the one found in the original Wii. The front panel is pretty plain and you can see the front USB ports, SD card reader and slot loading optical drive bay. More on the optical drive and then two of the four different antennas inside the Wii U for WiFi and the custom video stream to the gamepad. The other antennas and the tape job for wires. The fan is removed and the top shroud. While the heatsink is kind of large over the multi-chip module it is incredibly light made entirely of aluminum. The underside of the PCB has some more shielding as as well some loosely attached brackets on the side to facilitate securing screws. Some initial shots of the PCB including the Nintendo logo. There is a Panasonic chip here with the markings "MN864718 219P3162" and though I couldn't find any information on it we are guessing this is a video processor that may be sending the signal to the LCD on the gamepad. We also have shots of the new MCM with the IBM PowerPC CPU and the AMD GPU under the heatspreader. No, we didn't have the tools to remove the heatspreader though we have seen photos directly from Nintendo for that. 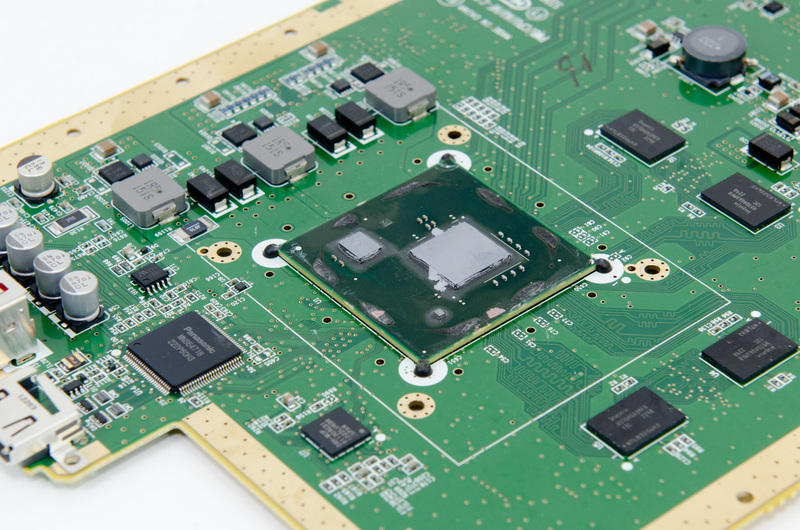 The MCM includes not only the two processors but also on-chip memory all on a single substrate. UPDATE: Anandtech actually took a razor blade to the heatspreader on the Wii U processor to reveal the silicon underneath (image link) and you can clearly see the AMD GPU (larger chip) and the IBM CPU (smaller) built using 40nm and 45nm process technology respectively. A very small die is likely some of-chip memory. A close up of more of the antennas. This first module is a Hon Hai Win-B2 Bluetooth controller. This secondary Samsung chip is an 8GB NAND flash chip that makes up the internal storage for this Basic version of the Nintendo Wii U. The Hynix H27U8G8G5DTR is an ePROM likely used for the BIOS/boot controller. The module with the grey/black wires is a Hon Hai Win-A2 802.11b/g/n WiFi adapater while the modules with the red and grey wires is a Hon Hai MIC-B2 and is a dedicated WIFI 11n device, like used to stream the video the the Wii U Gamepad. "The technology, co-developed by Nintendo and wireless and broadband communications giant Broadcom, marries run-of-the-mill Wi-Fi with a powerful bit of proprietary software to create a two-way stream of low-latency, high-definition video and controls between the Wii U and its innovative GamePad. That complex suite of software is designed to mitigate interference and deliver a smooth video signal and communication speeds, said Dino Bekis, senior director of wireless connectivity at Broadcom. The technology is built on top of something called Wi-Fi Miracast, which Broadcom first developed last summer. It's a system that is specifically designed to deal with interference issues while maintaining liquid fast two-way communication. Broadcom and Nintendo then teamed up to create a more solid system for the Wii U-to-GamePad connection." Finally, some more shots of those same modules. Well, that's it! We wanted to take apart the Wii U Gamepad as well but weren't able to because we didn't have the correct size tri-wing screwdriver. I'll give a couple of shops a chance today but I'm not holding much hope for that - check back here to see if we succeeded! Thanks to everyone that joined us on the live stream last night and don't forget to check back at PC Perspective for more events coming soon!! Wow did I understand correctly it has 16GB of ram? That really shows just how cheap ram is now. Thank you guys for the tear down! Oh I see, thank you for clarifying that for me. Just re-read the post and sure enough they stated that it was 16Gb/8 = 2GB. 8 bits in a byte. Aww man, how did I miss this? Encode faster! Full video is up now! Don't see what makes it cost so much. Or if locked onto a tripod, Lowest ISO, 1 second shutter speed, and the highest f value you can get without under exposing (and only increasing the shutter speed if the image is over exposed). As for the pricing, I think you might be low balling it quite a bit. Things like $50 Android tablets have the crappiest of touch screens and this one seems much better than that, even though it is still resistive. $50 android tablets do not have capacitive touchscreens. HUGE difference. The Wii U gamepad has a resistive, 480p, LCD screen. Those $50 Android tablets have screens on par with the Wii U gamepad, but the Gamepad doesn't have its own internal RAM, GPU and CPU. Supposedly half the Wii U's hardware budget was spent on its tablet controller; roughly $140 for the hardware and $130 for the Gamepad, with the rest of the budget going toward retailers, manufacturers and licensing fees. Huge mistake, I say, they could've released a beast of a console instead of this disappointment. This is the first generation a Nintendo console isn't my focus, I actually bought a PS3 that's coming to my place on Tuesday because I've given up on Nintendo ever releasing a good piece of hardware ever again. The 3DS was a disappointing abomination, the Wii U is currently a disappointment... they're gonna have to start bombing financially if they're gonna see that they're making big mistakes. Real fans would call for Nintendo's failure, that's exactly what I'm gonna do. Nintendo said they were taking a loss on every console sold initially. To me i really feel that they could easily knock off $100+ from the price and still make a profit. The question is: how much bandwidth does it gain from the eDRAM? I don't know if we'll be able to tell you that unless we get an answer from Nintendo or AMD. Insects have antennae. Radios have antennas. "For multiple aerials both plural forms are acceptable in scholarly works. The Latinate plural, antennae, is rarer in less formal settings." The proper pluralisation of the root antenna is antennae. Antennas is acceptable because "Every plural in English ends in -s" and so it has come into common usage. The only reason antennae is more associated with insect antennae is because botanists are happier with applying latin to everything. Both are correct, both will be understandable, being anonymous makes you a jerk. People likely to study insects. This may be the best comment thread on our site, ever. to the cpu and gpu, they do not know if its 45 nm cpu and they deffently do not know if its 40 nm or 28nm for gpu. Most likely its 28nm gpu, menaing with the measurments its a radeon 7770 while the cpu could be a 32nm since the plants to build that type of processes were operating starting in jan/feb 2012. So, with what i have seen, i think that the PS3 and the XBOX 360 (i own both) have way better hardware that this... so thanks for showing me this, now im positive im not going to buy a wii u, and to note, and seen this think that the wii u real price should be half of the actual one or lower but thats my opinion. So in your opinion did it worth buying a wii u? Don't buy it for the hardware, buy it for a unique experience. I think most analysis shows that the GPU is faster in the Wii U than in the Xbox 360 or PS3 though the CPU is maybe even, maybe a bit behind. Either way though, Nintendo will likely be a distant third when the new Xbox/Playstation come out next year. Its not that hard to outpower the current generation of consoles in EVERY aspect, Nintendo is so screwed... The cpu is like the brain of the console here. were u able the check the voltage of the power brick? will it work in european regions? Other advantages it will have over the other next consoles is its support for devs, especially indie devs. Nintendo is providing the cheapest of the consoles right now for devs/pub to develop on and is very easy to develop on. Not to mention the 1 year head start that wii u will have over the next 2. Which bigger game library, games developing on it first before the other 2, potentialy a price drop without losing money on the sales to the console, and perhaps all the features they promise to have in the future will be up and running by then and smoothed out. The Wii U certainly isn't cheaper than the PS3 or 360 and it's roughly comparable to the two in technical specifications, but Nintendo's online infrastructure is a joke compared to Sony's or Microsoft's. If you're an indie developer, you make games for a Sony platform for the Pub Fund initiative and easy-to-work-with publishing rules or you make games for smartphones. It's one thing to claim that your platform is indie-friendly and another to actually *be* indie-friendly. Nintendo is not an indie-friendly company. They said with the 3DS that they didn't want "garage developers" making games for their system, and it was only when Sony publicly claimed that indies are the backbone of our industry's innovation that Nintendo changed their tune. They want to SEEM like they're indie-friendly, but in reality they're just incompetent fools who can't put out good hardware, who milk their franchises worse than anyone in the industry while being less creative than Activision or EA and who coast off nostalgia and mediocre products with high profit margins. This isn't the Nintendo I fell in love with as a child and grew up with, with is some freakish bastardization. Don't you try to spin things as if they're better than they really are, coddling Nintendo only enables their mediocrity. I was wondering do you plan to disassembly the controller too? I am really interested in seeing that. The 12 stands for 1.25ns which means that they're 800Mhz components (DDR3-1600)! Any picture of the bd drive pcb??!!?!?!?!?!?!?!? well in fact, people who specialize in the study of insects are called entomologists. i watched the teardown, thanks guys, keep up the good work. Holly poop that CPU is small! Anandtech measured 30mm2. That's about as big as a single core Atom, and both are based on 45nm. With three cores, each core would have about a third the transistors as the Atom core. There is only so much you can do with such low transistor budgets. I love how everyone here is thinking about PCs when they are talking about the CPU and GPU. Consoles are different than computers. It has alot more to do with architecture then raw power, since each game made for the system is optimized for the hardware provided. Sort of, but at the end of the day hardware is hardware and its relevant to compare apples to apples. I believe nintendo is onto something special with the Wii U.
I think the Wii U is gonna have a serious front line run in First place for the next 3 years..
Sony is becoming another Sega after the flop on their handhelds and now the ps3 being looked at as a step under the 360 because it basically has all the same games give or take a few and the few exclusives don't boast anything special. I seriously think that Sony's gonna can out in the console race.. Microsoft is gonna move back towards the Application Users with strictly Tablet based products. Long Live Nintendo and it's about time they got the motion controls down pack and were able to add good graphics, a tablet style controller and all the functionality of the other consoles but with better shaders and visual depth. Take a look at Batman on the WiiU compared to ps3 and 360. So if i understand completly this is like having a good 2007+ computer with a good 7770 in it... (if its about the same then this is far better then ps3 or 360. As far as i know. graphic never made a game good. gameplay is what makes a game good and i see full of potential in the gamepad. I know nintendo gets greedy sometimes but they do get some good things out. Wow! Taking apart the Wii-U looks like loads of fun! I kind of want to take apart mine now... If I understand correctly I will need a tri wing screwdriver and will have to buy it online at a site like this http://nintendoscrewdriver.com correct? I have heard that you can't really find them anywhere else online. I Think its best to stay nostalgic when it comes to the Nintendo. But those days have past and there falling behind. Nintendo think they can just make sume cheap peas of crape whith old techtnolagy and eny old fool will buy it. but some people have the understanding on quolaty. WHEVE GROWN UP AND CRAPY MORIO GAMES AND MARIO CART GAMES ARNT GOING TO CRACK IT, WELL MABE FOR KIDS.